Dementia Friends is a global movement which encourages individuals to consider how they can support people in their communities who are living with dementia. Minnesota has been a leader in the Friends program, being the first state to have a Dementia Friends program in the United States. ICRN brought the initiative to Illinois about a year ago. Now it’s Wisconsin’s turn to join the efforts. 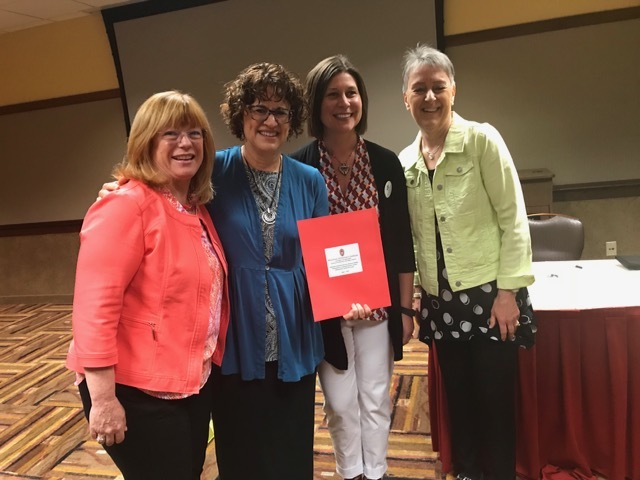 At their recent statewide conference, the Wisconsin Dementia Resource Network, invited Emily Farah-Miller of Minnesota and Susan Frick of Illinois to share their states’ efforts for a discussion as they look to begin their program. Pictured Kathleen Smith, Susan Frick, Emily Farah-Miller, and Kate Kolwalski. Kathleen and Kate will be the Master Champions for their state as the roll out Dementia Friends Wisconsin.